Hello, all you lovely querying authors out there. Cupid’s Literary Connection is hosting a great contest for February. Get your query seen by a fantastic list of literary agents in a variety of genres. It’s a ‘speed dating’ contest where agents can select queries to request manuscripts from, but our identity will not be revealed until the end. And we fight for the queries we want to request! Projects are screened by publishing professionals. What an exciting event! Good luck! Learn the rules from Cupid’s blog post. 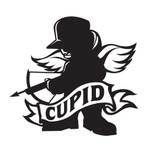 Or follow Cupid on Twitter. It’s a great chance to find a literary match this lovely month of February! Apparently there will be some Twitter trash talk. So stay tuned! Oh no! Next month perhaps? I know Cupid’s Literary Connection is doing contests every month. Stay tuned! I wonder how many queries will be in the drawing; that’s quite a concept. I’m assuming Cupid’s Literary Connection has some sort of weeding-out process so you don’t get deluged? Yes, there is a week of filtering from the 100 queries downward. This is very interesting.Keep up the good work. Speed Dating .